The man who discovered the massive reptile had to do a U-turn to clarify what he was seeing. It then took a "great team effort" to capture the reptile. Alligators are nothing new in Florida, but the Davie Police Department recently caught a gator that’ll make you look twice. WFOR-TV reports the policemen were called to a bike trail near a canal, where they discovered an 11-foot, 450-pound gator staring back at them. 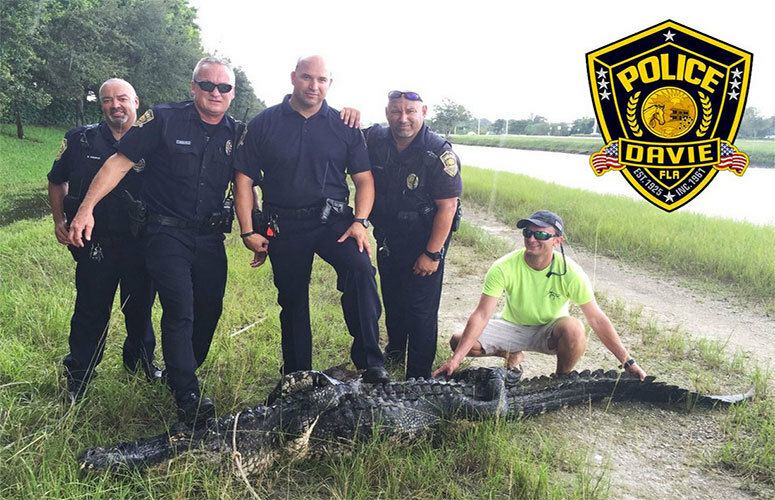 “Probably the largest alligator that I’ve encountered out on the roadways and actually in Davie in my 19 years of experience with the road patrol,” Officer Anthony Berardo told the news station. Catching the alligator was described to WFOR-TV as a “great team effort.” Along with numerous police, it also required a trapper, who subdued the animal. The canal where the gator was captured is near Falcon Cover Middle School and Cypress Bay High School. The news station also reports the aftermath of the alligator attack on a toddler at Walt Disney World earlier this year was fresh on the minds of those around during the Davie encounter.